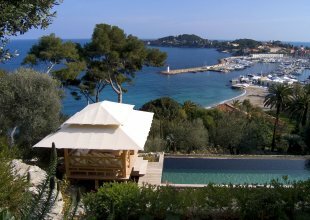 Located in the exclusive enclave of Domaine de Castellet in Villefranche/Mer, a 15 minute drive from Monaco. An eagle's nest built against a hillside, offering one of the finest panoramic sea views in the South of France. 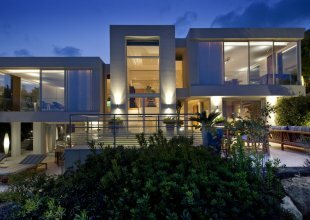 This architecturally designed villa oozes class and sophistication, cleverly moulded from both rough stone and polished glass, the villa feels as if it’s sculpted from the rock itself. The villa boasts an impressive interior sculpted staircase which takes you to all levels; alternatively, take the lift with access to all levels. Perfect for sundowners, the lush roof-garden has the most impressive views. Within the villa, the spaces are light-filled and extravagant, designed for calm contemplation or, equally, for impressive entertaining. And, always, everywhere, those spectacular views are around every corner! !